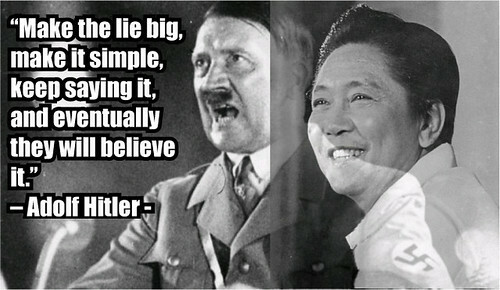 Adolf Hitler and Ferdinand Marcos were good at lying to their own respective countrymen just to satisfy their own selfish interests. Hitler initially used Christianity to gain support from the majority Catholic Germany. Later in his reign, his true colours appeared. Schools in Germany had songs of worship for “god” Hitler. While former evil dictator Ferdinand Marcos, in order to get votes from the naive Filipinos, wrote his own biography which primarily focused on his own life as a World War 2 guerilla, and the war medals he gained, which were later found to be fake. READ Do Not Abolish PDAF and Congress!